Good morning from very cold Hamburg and welcome to our first Daily FX Report of this week. The USD made a profit against 15 of its 16 major counterparts. We wish you as always a successful start in a new trading week. The EUR dropped for a second day against the USD and reached 1.4844. The EUR retreated from a 14 month high before a conference between euro area finance ministers in Luxembourg and as Asian shares extended declines after weaker U.S. equities on Friday. The EUR fell also versus the JPY to 135.02. The USD climbed against 15 of its 16 most traded counterparts as Asian shares followed declines in the U.S. The USD rose versus the JPY to 90.95. Furthermore, the USD climbed against the AUD to 0.9135. The NZD dropped versus the USD to 0.7385. In the U.S., the Standard and Poor `s 500 Index dropped 0.8% after the Bank of America, the biggest U.S. lender, posted a larger than forecasted third quarter loss and the U.S. consumer confidence declined more than economists had estimated. In Japan, the Nikkei 225 Stock Average retreaded 0.8% and the MSCI Asia Pacific Index of regional shares lost 0.6%. The EUR weakened after the finance minister of Luxembourg, Jean Claude Juncker, said that the EUR gains will be discussed at a gathering of the European area finance ministers. Since the middle of September, the EUR has been trading in a bullish trend channel against the GBP. Recently, the currency pair has left its trend channel and crossed the bottom trend line. 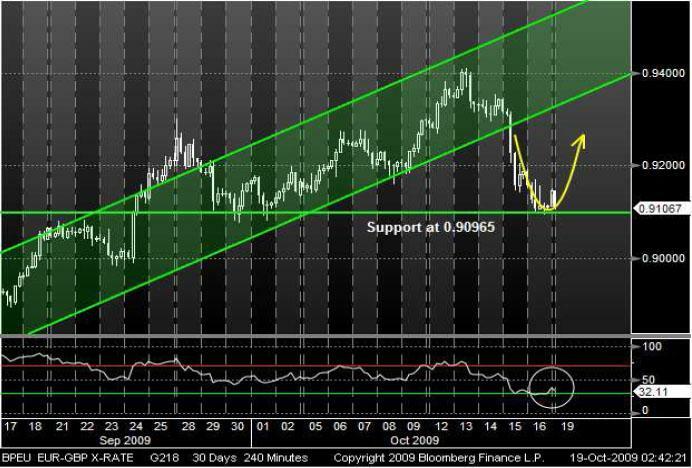 After it touched its support line at 0.90965, the EUR could recover from its downward movement. 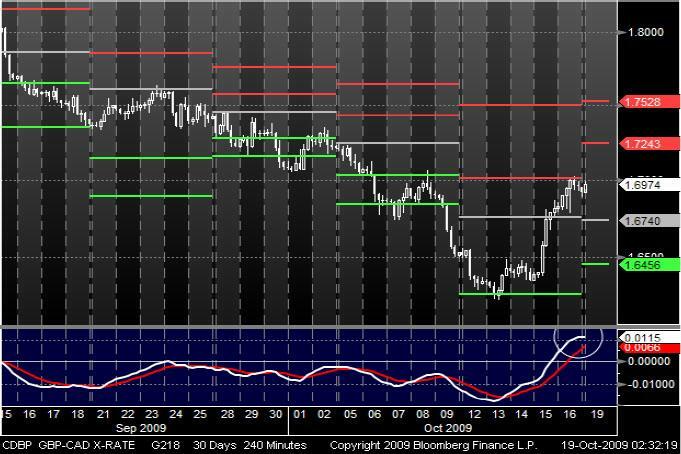 Furthermore may indicate the RSI an increasing trend and a successful pull back for the EUR. It remains to be seen if the pull back is strong enough for a return in the trend channel. During the last two months, the GBP has been trading in a bearish trend versus the CAD. Last week, the currency pair recovered after it touched its Pivot point at 1.6456 and started a bullish trend and reached its resistance. After the GBP touched its resistance, the prices rebounded. Also a crossing MACD through the signal from the top could support a continuing bearish trend.